Sometimes, you can arrive at a “bucket list” location and it’s disappointing when it doesn’t live up to your expectations. So let’s get that out-of-the-way now: That won’t happen at Acadia National Park. It’s an utterly awesome place. If you haven’t been there yet, make sure it’s on your own bucket list. “The Bubbles” mountains from the southern end of Jordan Pond. I used a polarizing filter for this and I like the way it renders the nearby rocks through the water and the trees on the left. ISO 100, f/16, 1/10 second, at 16mm. This place on the south shore of Jordan Pond is one of the most iconic views in the park. I looked and was surprised there weren’t any holes worn in the rock from all the tripods over the years. But I didn’t let the fact that everyone takes a photo here stop me – I couldn’t resist making one of my own. I’ve wanted to go to Acadia for a long time. My friend Kevin M. went last year and raved about it. When Mary Kate suggested I go up with her, it was an offer I couldn’t refuse. It’s a landscape photographer’s paradise. I spent almost 6 full days there. I met MK and her coworker Ryan on Friday evening and they left Sunday afternoon. Fellow Photography Interest Group member Tom M. arrived Monday afternoon and we stayed until Thursday morning. It’s brimming with photo ops: rugged shorelines, sandy beaches, granite mountains, calm mirror like ponds, beautiful forests, gnarled trees, lighthouses, fishing villages, whales, birds, and more. It felt like there were photos everywhere I looked. Acadia is small for a national park (at least compared to some of those out west) but it still covers a very large area. And getting from the Bass Harbor Head Light all the way to the Schoodic Peninsula can take some time, especially with traffic during the peak summer season. This map shows where I made my photos. You can see I made it to much of the park, but I missed an even larger part of it. Not to mention that I mostly stayed close to the car. I didn’t explore any of the hiking trails and carriage roads. I guess I’ll have to keep it on my bucket list and go back! I visited several places more than once and the changing light and weather made them look very different. Bubble Pond, Schoodic Point, and Cadillac Mountain were my favorites. Looking north-west from Otter Creek Drive, with Cadillac Mountain in the distance. A 5 frame panorama, captured in infrared and converted to B&W. ISO 200, f/5.6, 1/160 sec, at 28mm (equivalent focal length). I found the spot above just driving around, not from a guidebook. The fog in the distance and the lily pads in the nearby pond called out for a photograph. 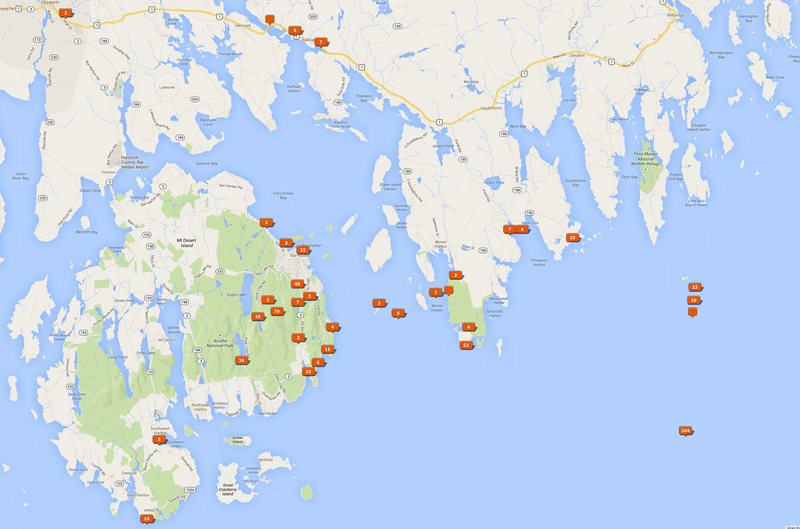 Schoodic Peninsula is in all the guidebooks and you must go there. We spent hours looking for compositions hidden in the rocks, cliffs and waves. Just make sure you’re careful. The rocks can be slippery and unexpected waves have washed people into the water. Schoodic Point Waves. I used a Hoya ND400 filter on this to slow my shutter speed. Even though the sun had been up for a while, I could expose at ISO 100, f/16, 4.2 seconds, at 16mm. Sieur de Monts is in all the guide books too and when I saw photos of the birch forests I knew I had to stop there. Tom and I initially made a wrong turn, but finally found it. And what a wonderful place it was – well worth the walk! Paper Birch and sedge grass forest, along Jessup’s Path. This is a 6 frame panorama, captured in infrared and converted to B&W. ISO 200, f/5.6, 1/100 sec at 28mm (equivalent focal length). We saw wildlife too. On Saturday morning, MK and I took the Puffin / Whale tour offered by Bar Harbor Whale Watching. It was a bit foggy, but nice enough and the captain managed to find both Atlantic Puffins and Humpback Whales for us. We also saw several lighthouses that we wouldn’t have spotted otherwise. In addition to the puffins, I photographed four other new life birds: Arctic Terns, Black Guillemots, Great Shearwaters, and Great Black-backed Gulls. And there may have been a few others that I didn’t recognize / identify. Back on land we saw deer a couple of times, and (heard about) a bear. But sadly, no moose. Two Humpback whales show their tails on the way back down after surfacing. We watched a group of three feeding together. As the boat idled they often came close. Researchers keep track of the whales and ID them from the patterns on their tails and backs. The whale on the left is “Bottleneck.” (HWC #8807) and was first sighted there in 2004. The other whale is “Vee” (HWC # 0372) and it was first sighted there in 1983 and has also been seen in Puerto Rico. ISO 400, f/8, 1/1000 sec, at 155mm. After the boat tour, MK and I drove up to Prospect Harbor to visit Janet M. She was Mary’s music teacher in Orlando and retired to Maine. She and her husband Arnold are outstanding tour guides – they drove us around the Schoodic area and showed us many sites from a local’s perspective. And then they shared a delightfully delicious dinner of Maine Lobster Mac and Cheese, salad, and Maine Blueberry pie for desert. What wonderful hosts! The Bar Harbor Whale Watching Puffin / Whale tour posts photos taken on their tours on their Flickr stream. I brought a full (and heavy) photo backpack and used a lot of the gear. We flew into Bangor on smaller planes so be careful that your photo luggage meets the carry on restrictions. I was very glad I had a wide-angle lens, my IR modified camera, a tripod, and polarizing and ND400 filters. Kevin M. loaned me his 70 – 300mm lens and I used that for whales and puffins. I filled up my camera memory cards for the first time in a long while. Bring extra, or some way to back them up so you can safely erase them. Atlantic Puffins are small – and far away from the boat! There’s one tour that actually puts you on the island where they nest inside blinds close to the birds. But I heard that the waiting list is over a year long. Whales on the other hand are large and sometimes close to the boat. You can get some good photos even with a phone. Make sure you practice your photography skills before you go. And know your equipment – no new gear right before the trip. You want to know what to do when you get there, not figure it out in real-time. Guidebooks and research are helpful, but don’t get too focused in on what others have photographed. Photo ops are easy to find and I enjoyed trying to put my spin on some of the well-known locations. It’s crowded in July and August. Especially Bar Harbor and the main park visitor center. But you can avoid those areas and find places / times where there’s no one else around. The food (especially seafood) is wonderful – arrive hungry! I’m from Florida, but the weather was hotter than I thought it would be (highs in the 80s) and the biting bugs were worse than I thought they would be. The weather varied too. There was some fog / mist and drizzle. I was actually glad, because the coast of Maine is known for that, and it gave us some distinct looks. Bubble Pond looked very different depending on the time of day and the wind and visibility. But fog did spoil one sunrise (after getting up at 3:30 am!) and Tom’s offshore lighthouse tour. So plan on some reduced visibility and stay a few days longer if you can so you can go back to some locations. Finally, enjoy yourself. Relax – don’t get overwhelmed. Create a lot of memories, not a lot of stress. I thoroughly enjoyed myself and came home exhausted. I took too many photos and spent too much time going through them after I got home. But I like how they turned out – please take a look at the other ones in my Flickr album when you get a chance. I’ll leave you with a short conversation I overheard on the top of Cadillac Mountain while Tom and I were photographing Bar Harbor after dark. A little girl, pointing at Tom and I: “What are they doing Daddy?“. Thanks for stopping by and reading my blog. Now, go make some photos! And use the biggest camera you can! Love the child’s comment! And what fabulous images Ed. The place looks amazing. No surprise you filled your cards and took forever going through your booty. Magical times! Thank you, Rhona – I guess you can tell I had a great time!